Arguably the world's most romantic flower, nothing beats a bouquet of peonies with their fluffy heads and pretty colours. This bouquet is simply wrapped in a fun print newspaper - we can also wrap in plain white - your choice. Choose 5, 10, 15 or 20 stems, wrapped with assorted greenery. The peony season is runs for a very limited time, so grab this special while we can offer it. 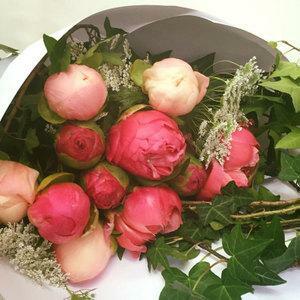 You can order peony bouquets through Victoria Park Flowers by clicking here!